Subprime lending is defined as “making loans to people who may have difficulty maintaining the repayment schedule.” Although not a hard and fast rule, those with FICO scores of 640 and less are typically the targets of subprime loans. This type of lending is also hallmarked by borrowers that can’t borrow elsewhere – much as federal student loans are offered without regard to credit criteria (with the exception of PLUS loans). Today, the New York Federal Reserve released a report showing that those with lower credit scores are increasingly those that must borrow to fund their college education. This information goes hand in hand with what we reported last week – that the middle class are hardest hit with student loans. The Fed released year over year data comparing Q4 2012 with Q4 2013 and the group with the biggest jump in student loan debt over this period were those with credit scores of 680 and below. 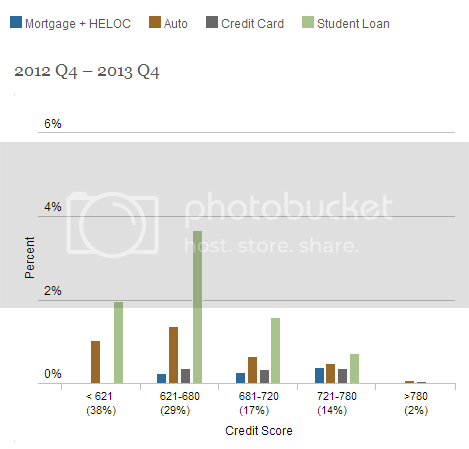 See the chart below and you see that those with prime and superprime credit scores (i.e. good and really great ratings) experienced the lowest growth rates in student loans. The credit rating statistic holds true whether you look at those under age 30 or those of all ages that are borrowing to attend school. The majority of new student loans are issued to those under age 30. Relatively few older Americans borrow to finish or return to school – and likely relatively few do so except in cases where they need more skills to reenter or compete in the job market. What’s interesting is the striations of credit ratings in the under-30 bracket. StatisticBrain.com data shows that consumers age 30 and under have credit scores that hover (on average) in the mid-640s. Align this with the student loan debt numbers released by the Fed and you see that there are consumers in this age group that have good credit – and even great credit. Although we don’t have a clear statistical line of sight between these numbers and the Dartmouth study we discussed last week that showed how hard hit the middle class is by loans, the data seems to set a clear indication that those with less money are disproportionately indebted for their education. It stands to reason that those young people from higher income homes will have higher baseline credit scores, are more likely to have credit cards at a younger age and other credit arrangements initiated or underwritten by parents with money that get them off to a good start with their credit rating and arm them with the resources to stay on track financially or buoy them if times get tough. Subprime lending, although looked down on, is a necessary financial mechanism for people that don’t have a good credit rating or the cash to pay up front to get the goods and services they need – including a college education. As indicated by the New York Fed data, those with lower credit scores are more prone to take out student loans and they are given without regard to poor credit. This sets them on a course of years of debt and potential financial difficulty and, depending on the debt load and earning potential, dire consequences. To help protect your credit rating, make sure you make on-time student loan payments – use our free student loan tool to track your loans, payments and prospective pay-off dates. If your payments are unaffordable, check out our Student Loan Help Center for information and how-to guides on signing up for cheaper repayment options like Income Based Repayment or Pay As You Earn.